Discover and Connect but Don’t Steal this Book! This post was written by Julia Blakely, Special Collections cataloger. It first appeared on the Smithsonian Collections blog here. Why the owner, Lewallen Jackson, held this book so dear that he recorded such a threat on December 26, 1825, is one of those mysteries. Perhaps it was his standard—and effective—marking. And, of course, the early nineteenth century was still a period when books were expensive and not readily available, particularly for the frontier farmer that Jackson appears to have been (from a quick look at online Census records). This inscription happens to be located in an important work. Much appreciated in its time, this first edition of Notes, on the Settlement and Indian Wars, of the Western Parts of Virginia & Pennsylvania by Joseph Doddridge (Wellsburgh, Va.: Printed at the Office of the Gazette, for the Author, 1824) was followed by two later versions (in 1876 and 1912) and many later reprints. None other than Theodore Roosevelt proclaimed it to be “the most valuable book we have on old-time frontier ways and customs.”* Although never much to look at, not being an example of fine printing and lacking illustrations, it is cherished today. Written by a pioneer minister, physician and historian, it is regarded as being accurate and knowledgeable about the United States’ early westward expansion. The volume also contains some of the ever-popular Indian captivity narratives. 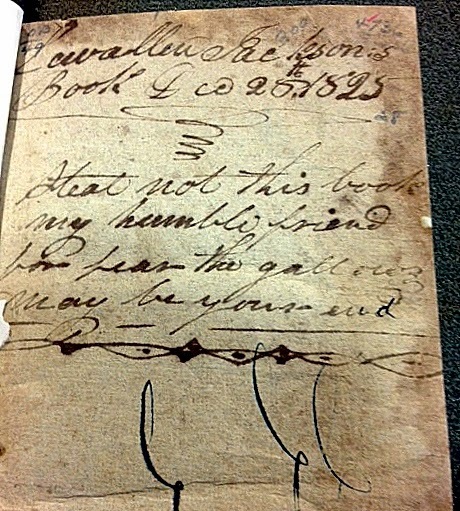 This copy can provide the researcher with some information about early American book ownership and reading habits. “Steal not this book” at least brings a chuckle to the modern reader! *quoted in J. Merton England, “Some Early Historians of Western Virginia,” West Virginia History, January 1953.